Earlier this month I traveled out to Roosevelt, Utah, for work. Since I don’t make it out to eastern Utah very often, I took advantage of the opportunity and spend half the day photographing a few sites. It was dark when I headed home from what ended up being a long, tiring day. But little did I know, two minutes further up the road, an oil tanker would poorly navigate a turn in Daniels Canyon, slide off the road, jackknife his trailer which would subsequently burst in to flames, closing down the canyon. Rather than sleeping in my car, I wanted to be part of the action. While all the other stranded motorists snapped photos with their cell phones, I pulled out my Canon 60D, with a nearly dead battery, and began snapping photos. I had to up the ISO to 1600 to avoid blur and capture more detail, knowing I would need to fight with the noise in post-processing. After a while, the Wasatch County Fire Department showed up and went to work containing the fire. They couldn’t extinguish the oil fire, so there was nothing to do but watch it burn. 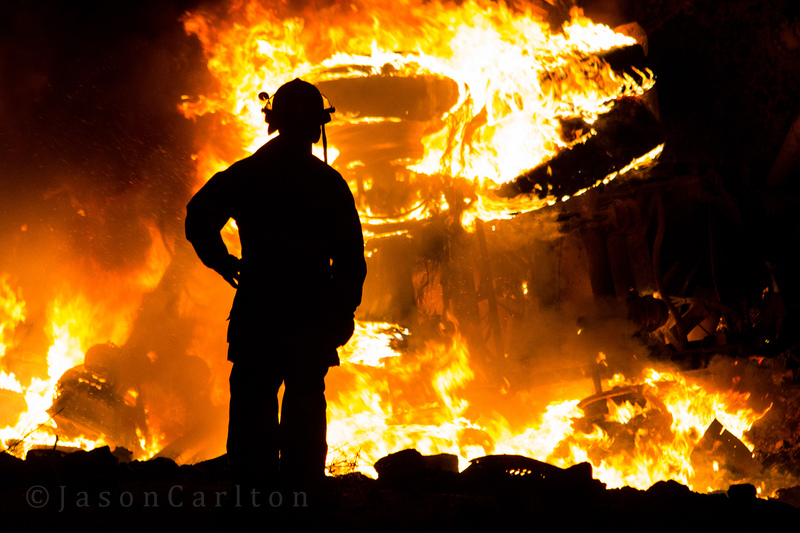 And that is when I captured this photo of one of the firefighters doing just that… watching it burn. After 1.5 hours stranded in the canyon, the fire crews opened up the road enough for us to pass through. I got home at midnight and was ready to go to bed… but not before tweeting out that photo to a local news reporter. That’s when multiple news organizations began asking me on Twitter if it was okay if they used my photos to report on the news story. I then had to edit my photos and then email them out to KSL, Deseret News, Salt Lake Tribune, Fox 13, ABC4 Utah, and even Good Morning America (though I was never able to see how GMA used the photos and I hope they didn’t just add it to a pool of clip art photos – because I probably could have charged them for that). Anyway, it was an honor to see it used by the local media, and I had my few minutes of fame playing citizen journalist. I’m also glad the battery held out long enough for me to capture enough photos to find the best ones. Now I think I have a strong entry to this year’s Utah State Fair for Journalism.